Clemons Boats offers new Bennington Pontoon Boats For Sale. We are a Bennington Pontoons authorized dealer. Proudly servicing Northern Ohio. Our dealership is located in, Sandusky Ohio. Let Clemons Boats find the Bennington of your Dreams! Click here to view our in-stock 2018Bennington Pontoons. When we started Bennington in 1997, we had a vision for our company that included a commitment to continuously improve both product quality and quality of life for our customers, our employees, our suppliers, and our dealers. Today we are just as committed to our goals as we were when we wrote our vision statement 17 years ago. We know there are some things you cannot compromise, and knowing that our customers are our best asset is among them. Through word of mouth, dock talk, and the recommendations of friends and family, Bennington has grown to become the most respected name in the pontoon business. We could not have achieved this benchmark without our customers. Adding to our strength, Bennington is backed by 9 consecutive CSI awards, our industry’s recognition of strong customer satisfaction. Not only that, but Bennington has earned 4 JD Power awards since the independent research firm began awarding honors to pontoon manufacturers. How did we get here? Hard work, belief in our team, and constant innovation. We start each and every day with a management meeting that includes our president and CEO, lead engineer, lead designer, lead production director and lead personnel from our sales and customer service departments. With the exception of the holidays, we haven’t missed one in 17 years. That’s dedication. That’s who we are. Take the time to look under and around any Bennington. The quality and attention to detail is unsurpassed. With one of the industry’s top designers and a team of thirteen skilled engineers, Bennington brings you the best in visual aesthetics, functionality, and performance. On top of that, we use only proven construction techniques and the highest quality materials. Since we take no design or construction shortcuts, Bennington pontoons will be the most luxurious, solid riding boats on the water. If you take the time to compare, your choice will be Bennington. Take the time to look under and around any Bennington. The quality and attention to detail is unsurpassed. With one of the industry’s top designers and a team of thirteen skilled engineers, Bennington brings you the best in visual aesthetics, functionality and performance. On top of that we use only proven construction techniques and the highest quality materials. Since we take no design or construction shortcuts, Binnington pontoons will be the most luxurious, solid riding boats in the water. If you take time to compare, your choose will be Bennington. Our channels are twice as thick as those used by many of our competitors. Bennington’s taller 3” channel provides more vertical strength than the typical 2” channel. The heavy-duty cross channels combined with our extruded M-deck brackets and Fanged Elevator bolted deck construction minimizes deck twisting ensuring your Bennington will provide the most solid, quiet pontoon ride in the industry. 3” tall, .250” thick cross channels standard in bow and stern locations. 3” tall, .125” thick cross channels standard in mid ship locations. Our ergonomic design approach offers the industry’s most sophisticated seating. All Bennington seating features exclusive Icon Soft-Touch Upholstery. The Infinity Topcoat is engineered for ultimate UV stability, easy cleaning, resistance to abrasions, mildew and stains. A Satin texture weave backing allows for smooth, tailored, instant-recovery upholstery with no puckering, or bagging. The unique high density foam used in five compressions provides the perfect combination of support and plush comfort. 1.25″ Rails are serrated for strength and good looks, welded on 4 sides (not 2) and anodized after welding for a superior finish. 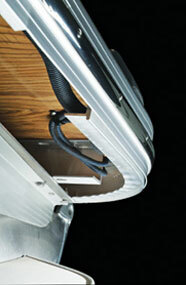 Extruded (.125″) deck brackets are thicker and stronger than thin sheet aluminum brackets. Our stern deck brackets have 4 points of contact, distributing weight evenly over the end cap, the strongest part of the tube. We space our deck brackets wider and lower than our competitors, greatly reducing the amount of twisting and racking the deck can experience while in rough water. Full length keels protect the tubes in shallow water and improve tracking while underway. Optional solid keels are recommended for use in salt water. All flooring is glued and stapled. One piece fiberglass consoles with plug and play waterproof Duetsch connectors virtually eliminates the possibility of electrical damage. Each boat is individually wrapped with protective cloth and double shrink wrapped to ensure perfection at time of delivery. All wiring harnesses feature marine grade, waterproof connectors. All under-deck wiring is encased in conduit. Bow decks and corners are reinforced with a .250″ radius bow channel that supports the heavy-gauge anodized aluminum bow trim. Stronger than bow corner castings, they are less susceptible to damage. 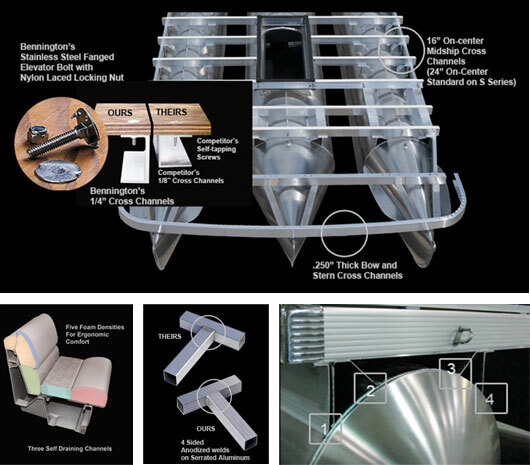 Cleats and stern corners are made of stainless steel, providing 3 times the strength of aluminum castings. They won’t pit, corrode or discolor. Tops raise and lower in seconds with our patented quick-release fittings designed to eliminate all rattles. The rail system is a solid, rattle free structure thanks to supportive aesthetics and a resilient sealing strip that’s placed between each panel and railing touch point. Rail spacers are placed between the deck and rail allowing easy deck drainage and ventilation to reduce mold and mildew. Here are a few of our in-stock Bennington Pontoon models we have for sale. 2018 Bennington 23 SSRFBXP If you are looking for a great, Lake Erie worthy Tritoon, look no further than this Bennington 23SSRFBXP with a 200 Yamaha! This boat just arrived and is available to view. This is one of our best sellers and handles Lake Erie with ease. Call 4196845365 to set up an appointment so we can show you why Bennington owns the Tritoon market in Ohio! This Bennington is a great design for entertaining, beaching, water sports, fishing….anything boating! It rides great and is has been equipped by us to handle the big seas Lake Erie is know for. 3-4 footers are no problem for this boat, and while doing it you will notice a solid, quiet ride! This 23 is equiped with a Yamaha 200 Four Stroke, Rough Water Package, Porta Pot, In Floor Storage, Power Hydraulic Assist Steering, Bimini Blue Ice LED Lighting, Sealed Lifting Strakes, Docking Lights, Simrad Go5 GPS, FastBack Stern Speaker Upgrade, Midnight Black Panel, Carbon Interior Accent with Sandstone, Black Canvas, Heavy Duty Rub Rail, Woven Vinyl Slate Flooring, Privacy Chaise, Elevated Helm, SPS Plus, Dual Battery, Wavetamer to the Bow, Ski Tow Bar, R Series Captain’s Chair Upgrade, and Sharkide Tube Protectant. 2018 Bennington 22 SSRX30 If you are looking for a great, Lake Erie worthy Tritoon, look no further than this Bennington 22SSRX with a 150 Yamaha! This boat is currently on order and not yet in stock. This is one of our best sellers and handles Lake Erie with ease. Call 4196845365 to set up an appointment so we can show you why Bennington owns the Tritoon market in Ohio! This Bennington 22SSRX is a great design for entertaining, beaching, water sports, fishing….anything boating! It rides great and is has been equipped by us to handle the big seas LAke Erie is know for. 3-4 footers are no problem for this boat, and while doing it you will notice a solid, quiet ride! This 22SSRX is equipped as follows: Matador Red panel with Champagne accent, Yamaha 150 4-stroke, Woven Vinyl Slate Flooring, simrad gps, curved bimini top, portable cupholder (2), R series recliner upgrade, extended aft deck, SPS tritoon system, rough water pkg, in floor storage, sealed lifting strakes, wavetamer to the bow, porta potti, docking lights, heavy duty rubrail, ski tow bar, privacy chaise, dual battery, Kicker Stereo Upgrade, Illuminated Kicker Speakers, and sharkhide tube protectant! Call us today and let us show you why Bennington has a 25% market share in Ohio, and why Clemons Boats should be your dealer! This new tritoon is for sale in Sandusky, Ohio. 2018 Bennington Pontoon 21 SLX This 21 SLX Tritoon just arrived. We have this boat equipped to handle big water, and you will be amazed at what it can do. Call 4196845365 for an appointment to view! If you’re looking for the best value in boating today, look no further than Bennington SX Series pontoons and tri-toons. Bennington offers enjoyment for everyone, combining comfort, style and function with an affordable price tag. Built in the heart of the Midwest by expert craftsmen, you won?t believe the value for the money. The SX Series is highly customizable with an abundance of options that will allow you to personalize your boat to your lifestyle. Check out the wide variety of stern lounge seating options, fishing features, bimini and camper tops, even an on-board sink! This Bennington 21SLX tritoon is equipped as follows: Metallic Sorrel panel, Yamaha 115 4-stroke, woven vinyl beige floor, striker 4 fish finder, table upgrade, Heavy duty rubrail, SPS tritoon system, Rough water pkg, Sealed lifting strakes, Battery switch, Wavetamer to the bow, porta potti, privacy enclosure, Skit tow bar, and Sharkhide tube protectant! Call 4196845365 for a private showing or shoot us an email. This new Tritoon is for sale in Sandusky, Ohio.